Well, the Boston mayoral candidates released their campaign finance reports for the second quarter and darned if the local dailies didn’t notice the same thing: No bucks yet from the big-bucks set. From businessman Jack Connors to developer John Fish to Red Sox CEO Larry Lucchino, Patriots owner Robert Kraft and concessionaire Joseph O’Donnell, many of the city’s top power brokers are playing it safe in the mayor’s race — but leaving the crowded field of candidates hanging in the balance at a crucial time in the election. A Herald review of the latest campaign finance reports found that Connors, Fish, Lucchino, Kraft and O’Donnell have yet to contribute to any of the dozen candidates running to replace Mayor Thomas M. Menino. Also sitting on the sidelines so far are Putnam Investments CEO Robert Reynolds, Hill Holliday CEO Karen Kaplan, State Street Bank’s Jay Hooley, Suffolk Downs chief Richard Fields, Celtics owner and venture capitalist Stephen Pagliuca, Red Sox co-owner John Henry and former John Hancock Insurance CEO David D’Alessandro. 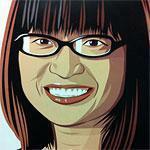 Popping crosstown to the Boson Globe, newly minted Business columnist Shirley Leung devotes her maiden voyage to the same topic – and pretty much the same names. If you are a serious candidate for mayor, you have driven past the scrubby warehouses of Newmarket Square, to the headquarters of Suffolk Construction, for an audience with CEO John Fish. And when you arrive, expect a surprise. Fish, an unofficial kingmaker in Boston, told me he’s in no rush to support anyone — not with his time, not with his money. Will he ever? “Time will tell,” Fish explained. He’s not the only one disappointing candidates this season. Many of Boston’s business elites are sitting on the sidelines in the first truly open mayoral election in 30 years. It would be unfair to call them apathetic. Their doors are open to candidates and they’re following the issues, but their wallets are closed and their BMWs are free of bumper stickers. Not everyone is abstaining, even if they are not exactly revealing their support. Boston developer Ronald Druker is doing his best impression of a high roller at a Vegas roulette table, betting the maximum $500 each on Felix Arroyo, Dan Conley, John Connolly, Rob Consalvo, and Mike Ross, according to state campaign filings. “I may ultimately give to some more,” said Druker. 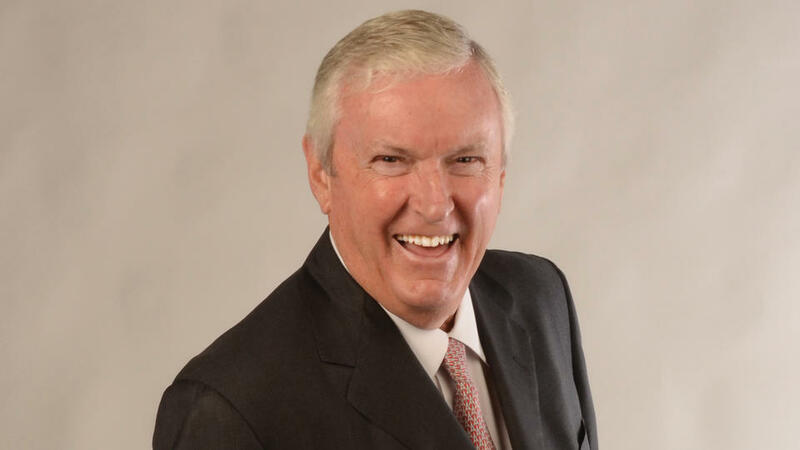 Developer Joseph Fallon, who is building out the Fan Pier office and condo complex in the Seaport District, gave $500 in May to Conley, the Suffolk district attorney, and raised another $30,000 for him. Fallon also contributed $500 to Consalvo’s campaign this month and has given to Marty Walsh’s run. One final note: Both papers also mention the Vault, a “cabal of executives” who engaged in a very high level of backroom politics for decades. The Vault was to mayoral elections in the ’50s and ’60s what the money primary is now. May the best (financed) man or woman win! UPDATE: The hardreading staff didn’t read hard enough. 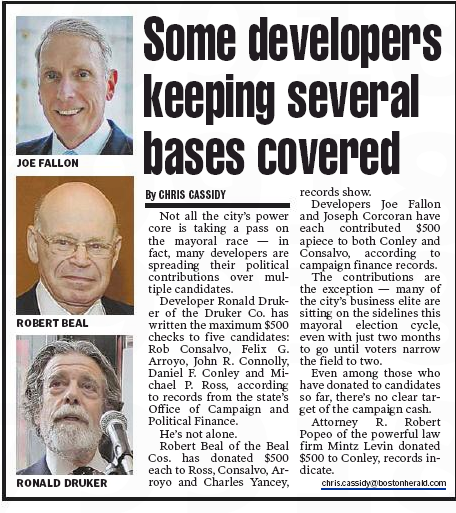 The Herald also mentioned the developers who have coughed up dough to several candidates.